Judith Schleicher and I have just left the eastern Indonesian island of Halmahera, which was the subject of my first blog post a year ago. We were there on the second supervision mission – something which must sound pretty dull. In fact it was a real pleasure to meet with friends in the project team again, to see how well they are doing, and pretty exciting to have two days and two nights in the forests of the northern block of the Aketajawe-Lolobata National Park to see – despite the rain – some of the biodiversity and human impacts in the area. P.T. Weda Bay Nickel kindly allowed us to use their helicopter to get into the forest, landing at the junction of three abandoned logging roads within the northern (Lolobata) section of the national park. Burung Indonesia is doing a fine job of executing this project and has already developed solid relationships with government, civil society and private entities to form a strong and informed constituency of concern for the protection of this new national park. Arrived at Ban Navang! 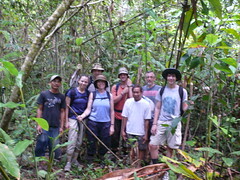 Arlyne and Tony with some of the villagers who were working on the wildlife monitoring. Feb. 8, 2007* - Second day of transect for us and third for the team. Arlyne and I joined a different group today, while Tony and Jim joined our group from yesterday. Mr. Xaypanya signals on the map where we went that day while Tony and Arlyne, on the left, and Jim and I, on the right, watch.